Contrary to superstitious beliefs, we think good things happen to you when you cross a black cat… like getting to be near a black cat, for instance! There are 22 black cat breeds recognized by The Cat Fanciers Association (CFA) that can be born with a solid black coat. All of which have unique personalities and traits, health concerns, and coat types. Here’s a look at 8 of our favorites, but of course, all cats are great in their own ways, and this isn’t meant to take away from the other beautiful 14 types of black cats out there. Also, the personality traits are generalizations, and naturally any individual cat can exhibit some or none of their breed’s common traits. Just something to keep in mind! This medium-sized, jet-black cat breed was developed in the late 1950s by American cat breeder Nikki Horner when she crossed a sable Burmese with a black American Shorthair. Her goal was to replicate the look of a wild Black Panther and I think it’s safe to say that she succeeded! Bombay’s are active and curious cats, especially while they are young. They are described as being playful, outgoing, gentle, and laid-back so they are usually a great breed to keep around children, dogs, and other cats. Unlike some cat breeds, Bombay’s are very affectionate with their humans and enjoy a good cuddle. Their short and fine, fully black coat has a glossy appearance with minimal shedding. A brush with a rubber curry brush once per week is sufficient for removing dirt and loose hair. Bombay’s are the only breed to have black fur exclusively, whereas the other breeds can be found with a variety of different fur colors. Bombay’s are generally healthy cats with little to no health concerns to worry about. However, there is a rare condition called Craniofacial defect that Bombay kittens can inherit from their Burmese genes. This defect severely affects the shape of their head, unfortunately leading to premature death or euthanasia. This well-known breed arrived in North America with European settlers in the early 1600s. It didn’t take long for the population to explode and to become treasured family members around the world. They are described as being a solid, medium to large-sized cat. American Shorthairs have a calm and gentle demeanor making them a great black cat breed for a family. Known as being friendly, easy-going, and playful it’s no wonder why they are one of the most popular cat breeds today! Unlike the Bombay, American Shorthairs have a thick, dense coat with moderate shedding. You should expect to brush them daily to minimize shedding and remove debris. Their coat grows thicker in the winter to accommodate colder temperatures and will require additional maintenance. American Shorthairs are generally healthy but could suffer from heart disease or hip dysplasia, both of which are hereditary conditions. The Cornish Rex is known for its egg-shaped head, large ears, and unusually long hind legs. They have an unusual short, wavy coat making them a unique choice of the black cat types. This small to medium-sized cat made its first appearance in Cornwall in 1950. Cornish Rex cats are highly active cats that enjoy playing, climbing, and interacting with their humans using a variety of vocal gestures. They are far from being a lap cat, but they are great around children, guests, and other pets. Their short, wavy coat is the result of a natural mutation and is described as feeling silky and soft. To avoid damaging the delicate hairs in their coat, you can occasionally brush them using only your hand. There are minimal health concerns for a Cornish Rex, but their thin coat means they are susceptible to sunburn and cold weather. Other possible ailments include heart disease and Patellar Luxation, a condition affecting the kneecaps. How Long do Cornish Rex Cats Live? This black cat breed has a distinct trait, a shortened tail! The result of a natural genetic mutation, the American Bobtail has been adored for their unique appearance since the 1960s. They are often described as being a medium to large cat breed. American Bobtails are described as being friendly and sociable cats who won’t shy away from house guests. They’re devoted to their humans and love to play and hunt. 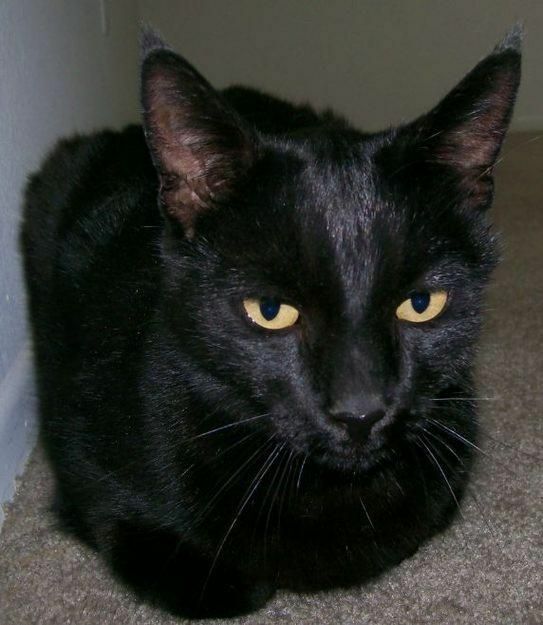 This adorable black cat is well suited for children, families, and individuals looking for a cat companion. Their medium to long-length coat needs to be brushed a couple of times per week to avoid mats and tangles. They aren’t heavy shedders, but you might notice more hair during the spring and fall seasons as their coat adjusts for the weather. American Bobtails have healthy backgrounds, but the tail-less variety can occasionally suffer from spinal issues affecting their ability to pass stool. Native to Britain, the British Shorthair is the pedigree version of the common British house cat with history dating back to the first century, making it one of the oldest cat breeds known to us. It is one of the larger types of black cats, weighing up to 20 pounds when fully-grown. British Shorthairs are described as being a mellow and relaxed cat breed. They enjoy being around their human companions and children, but they hate being picked up or carried. By their first birthday, they will lose their kitten playfulness and spend more time lounging around the house. They’re even described as being non-destructive, an added bonus for your furniture! Sometimes described as a teddy bear, British Shorthairs have a short, smooth coat that only requires weekly brushing to remove dead hair. Gingivitis and heart disease are the two most common ailments affecting the British Shorthair breed. Russian Blacks were derived from the Russian Blue breed in 1971. A small to medium-sized cat, they are a good choice for allergy sufferers because they produce less of the glycoprotein Fel d 1 and shed less than other breeds of black cats. They are described as being extremely affectionate and non-destructive like the British Shorthair. Russian Blacks are known to be devoted family pets that enjoy being around children. Their energy level is on the lower side, but they will still participate in learning tricks and playing with toys. Russian Blacks have short, shiny coats with a silky feel. They are not heavy shedders and only need to be brushed once per week. Being a hardy cat breed, there are very few health issues for the Russian Black. Originating from Iran, Persians are well-known for their short face, snub nose, and overly fluffy coat. Persian cats first became popular in the Victorian era and they’re still popular today – in fact, they are the most popular pedigree black cat breed in North America! Persian cats are a quiet, sweet breed that would rather cuddle on the couch with their human than run around the house. They’re not the most child friendly breed available, but they will happily accept affection from older children who have mastered using gentle hands with animals. There are a number of possible hereditary health concerns that can affect a Persian cat. This includes: polycystic kidney disease, bladder stones and infections, blindness, heart disease, and liver shunts. Most conditions occur after their 7th birthday if at all, but blindness can occur as early as a few weeks after birth. Due to their flat nose, they could have breathing difficulties and increased sensitivity to heat, so you should take precautions to keep your Persian cat cool in the summer months. The most recognizable trait of the Scottish Fold is their distinctive ear shape. Born with a natural genetic mutation, Scottish Folds lack necessary cartilage in their ears causing them to have their folded appearance. Their unique appearance and loving personality make them a highly desired black cat breed. Scottish Fold cats love human interaction and don’t like being left alone for long periods of time. They are moderately active and enjoy playing with complicated puzzle toys designed for cats. They’re great lap cats that will enjoy getting attention from the entire family. The Scottish Fold breed exists with two coat types, a short plush coat or a medium to long-hair with tufts of fur on the tail, ears, and toes. Their coat requires brushing weekly to get rid of loose fur and dirt. Most Scottish Fold cats live long and healthy lives, but some of them might develop heart disease or degenerative joint disease as they age. Want More Black Cat Types? We’d love to add some more black cat breeds to this list, why don’t you comment on Facebook and let us know which one you would like to see next? Better yet, if you’ve got another breed of black cat, and would like to send in some photos of your special little pal, we’d love to share them on the site and they can become the “posterchild” for their breed – wouldn’t that be fun?